Benefits of Relocating Your Factory from China to Semarang Review by tenissa.tjahjono on 14. 1. 2019 Company Registration in Indonesia, Market Research in Indonesia, Work Permit in Indonesia, Product Registration in Indonesia, Local Partner Selection in Indonesia, Trade Mission in Indonesia, Company Formation in Indonesia, Company Establishment in Indonesia, Company Set Up in Indonesia, Payroll Outsourcing in Indonesia, Tax Reporting in Indonesia, Medical Product Registration in Indonesia, Medical Device Registration in Indonesia, Cosmetic Registration in Indonesia, Food Supplement Registration in Indonesia. Even though the financial situation at the end of 2018 affected Indonesia’s economy negatively, the country is recovering, and funds are continuously pouring into many cities in Indonesia. This article focuses on the city of Semarang where overseas investment has been flowing mainly into the manufacturing of shoes, glass, small boats, textiles, and electrical equipment. Semarang, the capital city of Central Java and the tenth most populous city of Indonesia has become a haven for citizens of China followed by Japan, Singapore and South Korea. The business environment of Semarang and a strong Chinese presence have turned it into a place favourable for Chinese entrepreneurs and manufacturing companies. The old name of Semarang is Bergotam, and it is a city with a long history. For five hundred years, the Chinese and Javanese have inherited the spirit of Zheng He’s pioneering spirit and jointly created the city’s glorious history. Many ancient buildings and colonial monuments are still preserved to this day. In recent years, the economic index of Semarang has continued to grow, and many high-rise buildings have appeared, as well as industrial parks where many foreign manufacturing factories have already been or are being built. In November 2018, Semarang received Pro-Investment Reward acknowledging the enormous growth of investment pouring into Semarang and the efforts of its mayor to build positive business atmosphere. Why Should You Move Your Factory from China to Semarang? Semarang is definitely one of the cities in Indonesia with the most potential for development. To attract even more Chinese investors, the Indonesian Ambassador to China and Mongolia, Djauhari Oratmangun, promised to simplify the licensing process in July 2018. In a nutshell, investors are attracted by its strategic position, abundant labour and human resources, low operational costs and distracted by increasing labour costs in China. However, things have changed, and the potential savings of moving production abroad are enormous. When shifting production from China to Semarang, the prices of products can come down to 10-15%. Manufacturing in China has become less competitive because of the sharp increase in workers’ wages and consequently in the overall costs of production. 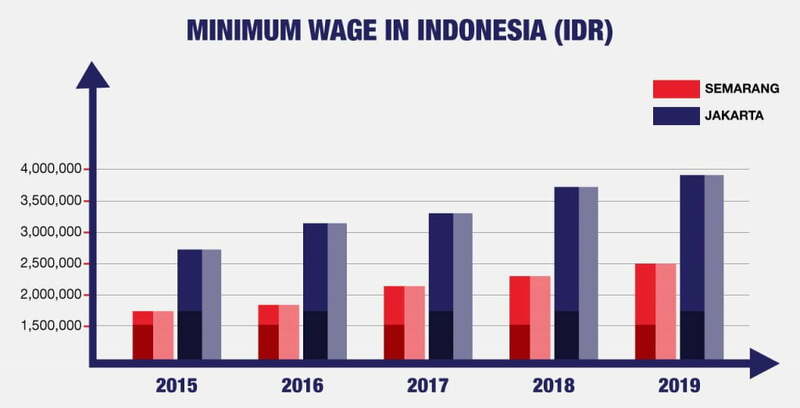 According to BBC.com, the salary of a Chinese worker has reached US$400-US$500 per month, which is more than double of a worker in Semarang where the minimum wage per month is set as low as US$175 (IDR 2,500,000). 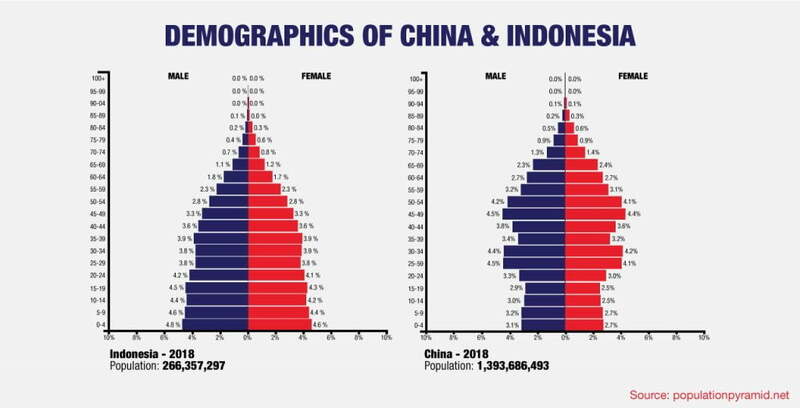 Even though the Chinese population is five times bigger the Indonesian one, the percentage of younger people in China is significantly lower. In China, the highest percentage of the population is now in their thirties and fifties, and the working-age population shrinks every year, currently being on its lowest level since 2009. The ageing workforce and slowing population growth (3.5 per cent in 2017) result in insufficient human resources and concerns about the future of the Chinese economy. In Indonesia however, the child rate remains positive, and the median age of the population is 30.2 years old with almost 45 per cent of the population aged between 25-54 years. Semarang specifically is one of the most populous cities in Indonesia, with several universities focusing on engineering. In total, approximately 20% of Indonesia’s working age population is employed in the manufacturing sector, giving no reason to worry for lacking the skilled workforce in Semarang. In recent years, the economic index of Semarang has continued to grow exceeding the national average. The enormous growth is the result of both rising values of foreign investment pouring to the city and governmental efforts. In 2011, the investment from private sectors reached IDR 1 trillion. A few years later and after several innovations, the investment hit IDR 20.5 trillion in 2017, and the growing trend is not expected to slow down anytime soon. The business potential of the city and its convenient location were one of the reasons why DHL Express, one of the largest logistics companies in the world, chose it as a gateway for its expansion to Indonesia. To support the development of Semarang and its position on the Indonesian market, DHL contributed to the city expansion with an investment of IDR 49 billion. As a result, Semarang received a Pro-Investment Reward in November 2018. This award acknowledges the enormous growth of investment, and the efforts of its mayor to build a positive business atmosphere. The representatives of Semarang are focusing on boosting the city’s economy by promoting industrial development and infrastructure improvements. A new airport terminal was opened in June 2018, expanding capacities of Ahmad Yani International Airport. Furthermore, construction of a Light Rail Train (LRT), connecting the airport with the city centre, is planned to begin in 2019. The infrastructure of Semarang is backed with the opening of Jakarta-Surabaya toll road in December 2018, which is connecting Semarang to both west and east of Java island. The construction of a semi-fast railway between Jakarta and Semarang is about to start in 2019 as well. Last but not least, the expansion of Tanjung Mas Port is an ongoing project that should increase the number of delivered goods to Central Java and serve as one of the main pillars for economic growth. The benefits listed below might not directly influence your decision to move your factory to Semarang, but they can make your stay there much more enjoyable. Several prominent Chinese companies have already settled in Semarang. Connect, network and collaborate to maximise your profits. Chinese investors do not need to fear of a language barrier that would prevent them from succeeding in their businesses. More and more people in Indonesia are learning Chinese and educating their children Chinese as well. Chinalink is a prominent Chinese language school in Semarang with well-structured Mandarin courses for people of any ages — ranging from kids to adults. Due to Zheng He’s arrival in Semarang in 1413, the Chinese community has been long in the city. There is even a Chinese quarter, or Chinatown, located around the Semawis street. Saying that you and your families might be surrounded by fellow Chinese citizens anytime throughout the day. A food night market is open on weekends (Friday, Saturday and Sunday) offering a wide variety of foods for your extensive culinary experience such as Chinese spring roll. Chinatown in Semarang is one of the oldest parts of the city, and it is filled with rich Chinese culture and values. These can also be seen in the placement of 10 Chinese temples — to protect the Chinatown from bad energy and to maintain the prosperity of the area. Semarang has definitely emerged as a destination of foreigner’s choice for its excellent location, low costs and increasing partnership with different countries, especially for the Chinese manufacturers who intend to avoid rising labour costs and slowing economic growth while moving to a city with a dominant Chinese minority. Are you thinking about moving your factory from China to Semarang? Cekindo is a market-entry service provider with three offices located in Indonesia – Semarang, Jakarta, and Bali. Do you need more information? Continue reading Semarang: The Future of Manufacturing Industry in Indonesia or contact us for a free quotation on establishing a business in Indonesia, and our consultants will get back to you within two working days.